Oof, right now the last thing I really want to talk about is sweet things. I had a busy, fun day filled with friends and sugar. It was the first really spring-like day of the year and we got out and enjoyed it, and earlier Z and I shared a plethora of really good cookies. I picked out Paradise, Epiphany and Rhapsody, which were all good but Paradise was definitely my favorite. I’m really into lemon right now and the bright zing of lemon in those cookies was so good. Plus, I got an almost whole macadamia nut in one bite – it doesn’t get any better than that! After we nibbled most of the way through the cookies, we attacked my very first red velvet cupcake, provided by Miss Iron Cupcake Earth: Coffee herself. We have three others but I had never tried red velvet (because I’m so northerly I guess) so I wanted to eat that one first. It was pretty much the cakiest cake ever. I do totally get the appeal, and I LOVE cream cheese frosting (and Carrie’s frostings are always so smooth and delicious! ), but it was too rich for more than a couple bites for me (soooo buttery…mmm). This was no problem for Z; he totally loved it and was more than happy to devour what I couldn’t finish. This smelled so amazing and would probably make phenomenal cotton candy or something equally ethereal. Of course, I had to bring some goodies along with me if I was going to be meeting up with friends! I’m still not over my obsession with pink and brown, so I went with that and took advantage of some leftover strawberry puree sitting in the freezer. 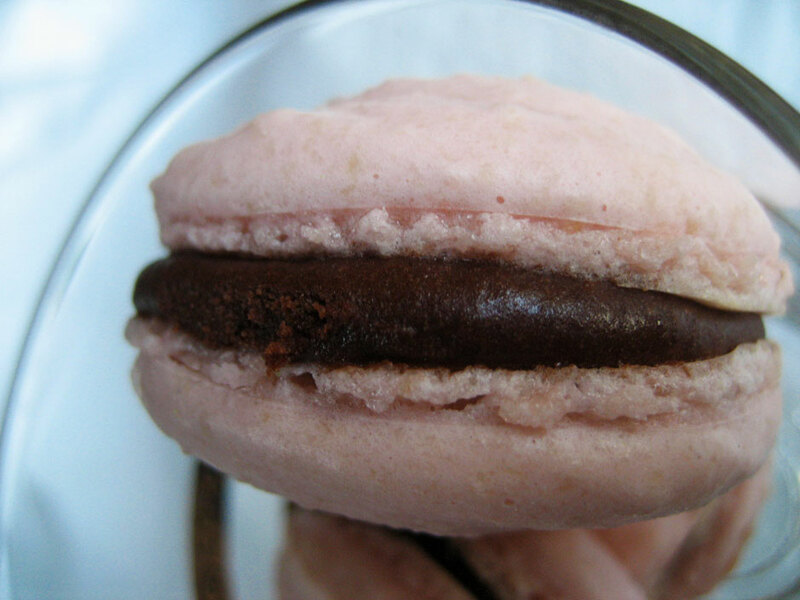 I combined it with some granulated sugar for macaron shells and added it to a rich chocolate ganache filling for some adorable slightly tangy and not-too-sweet little macarons. Much smaller and more my size than the last ones! I also recently got some nice orange blossom and rose extracts and wanted to make something else to pad out my little treat-boxes, so I kept with the color theme and made rose marshmallows (even my treat boxes are brown and I use pink ribbons…plus they’re the colors on my business cards…they’re just so DELICIOUS together). It was my first time working with such a concentrated flower extract and I added a bit more than I would have liked, though not enough to make them taste “soapy” or anything – just very very sweet and strong. These turned out much firmer than past marshmallows, but in a good way. I ended up tossing them in cocoa powder and that fixed them right up. They are absolutely dreamy with the bitter chocolate on the outside and the super sweet, incredibly fragrant rose marshmallow inside. Flowery marshmallows are definitely my favorite kind so far. The decision to make marshmallows only came after some matcha macarons failed. Well, they were sort of ok, but I piped some of them too close together and the batter was runnier than I’ve dealt with before for some reason. They did develop feet and a top crispiness and everything, but most of them ran together and stayed pretty wet in the middle. Plus the ganache I made for them, while insanely good with matcha (made with 87% cacao dark chocolate) ended up a bit too stiff to be easily pipeable. It WAS great, however, for rolling truffles. I beat some sweetened matcha into it and then rolled the truffles in more sweet matcha. By the morning, however, my sweet, grassy green little balls had become tacky – the ganache had somehow absorbed the matcha. While this made them absolutely delicious, it made the truffles look moldy. Shortly before we left, I tried tossing them around in some cocoa powder, and that, again, fixed them right up! Unfortunately I don’t have any pictures of them, or even really a recipe, but they’re really rich and simultaneously light tasting due to my using whipping cream as my liquid. I’m not discouraged by my macaron disaster. I just need to be a little more careful! I have at least one hopefully killer flavor idea and will keep working with them. They’re too amazing not to! Could these BE any daintier? Add the strawberry puree to the granulated sugar and combine fully. Allow to dry out (preferably near a sunny window) for a half hour or so, then grind with mortar & pestle. 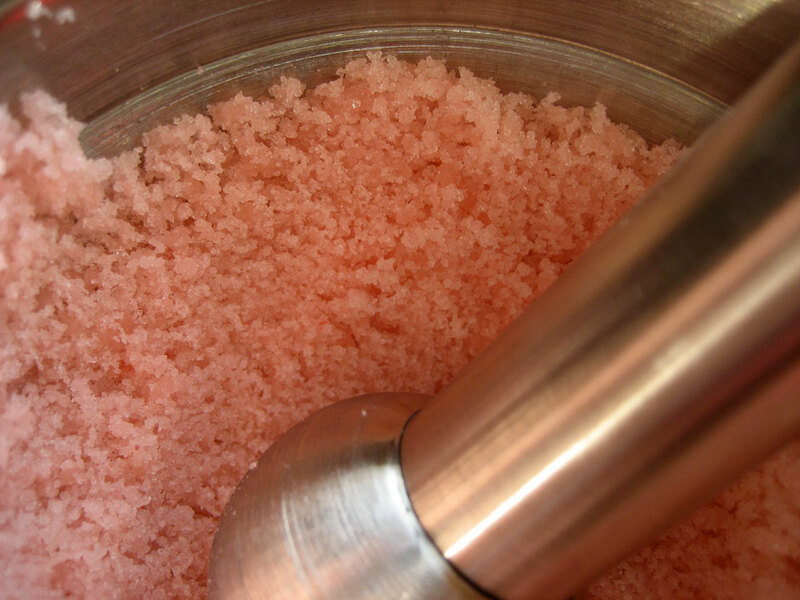 Repeat until the sugar is almost completely dry and there are no large chunks or crystals in the sugar. Meanwhile, prepare a baking sheet with a piece of parchment paper or a Silpat. If you are new to making macarons, you should use the parchment and trace circles (about 1.5″) on the back with a pencil so you have a size guide when piping the batter. Sift together the powdered sugar and almond meal. Whip the whites to a foam and gradually add the strawberry sugar to obtain a glossy meringue, then quickly beat in food coloring (you could add a lot to get brightly colored shells but I like them more pastel). Fold together the mixtures, working quickly at first and gradually slowing down as you go. You shouldn’t have to use more than about 50 strokes. Test a small amount of the batter by plopping it onto a flat surface. If the top of the batter flattens out on its own, it’s all set. If not, fold it a couple more times. Transfer the batter to a pastry bag fitted with a large plain tip and pipe into circles. If you’re using parchment, it’s a good idea to use a tiny bit of batter in each corner to stick the paper to the baking sheet, so it lays flat. 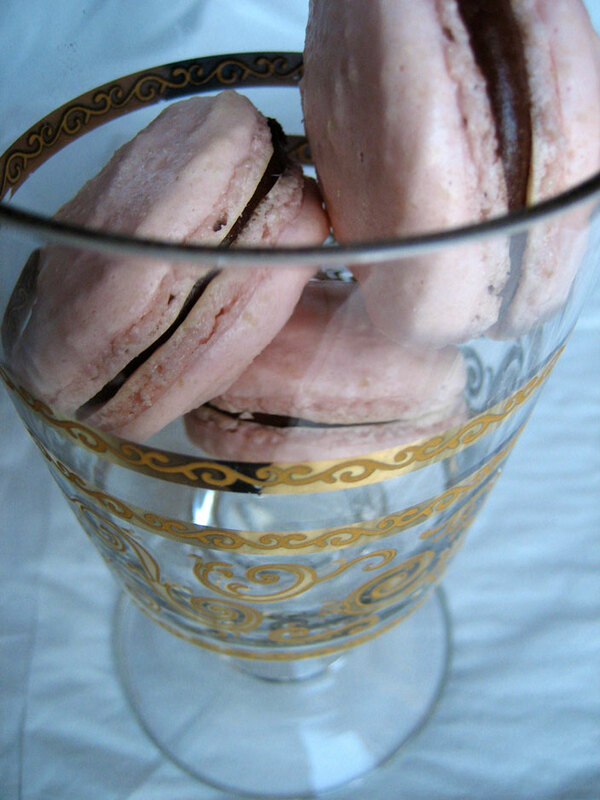 Once the macarons are piped, allow them to sit for an hour so a skin can develop. Meanwhile, preheat the oven to 300. Once the hour has passed and the oven is sufficiently heated, place the baking sheet in the oven and bake for 10-13 minutes (mine only needed about 10 – any more and I think they would have been too dry inside). Allow to cool fully on the baking sheet. I piped my circles only about an inch across, so they popped off the parchment easily and didn’t need any extra coaxing like the first ones. If yours do stick, however, put a few drops of water between the parchment and cookie sheet, and use a sharp knife to help dislodge any stubborn cookies. Once cooled, you can fill with the ganache. 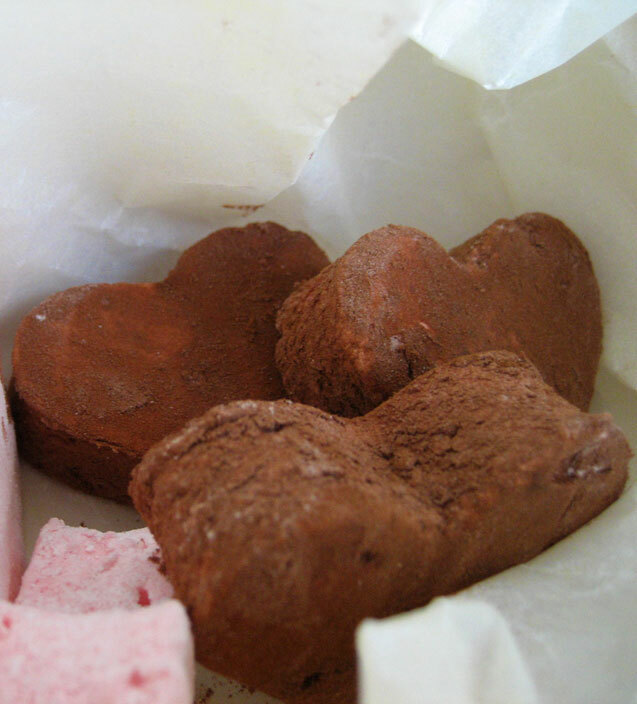 Place chocolate and cream in a microwave-safe bowl and turn on high for 30 seconds. Stir well and microwave for another 20 seconds. Repeat until the chocolate is evenly melted (I know this obviously isn’t the traditional method but it’s what Joe Pastry does and for a small batch of ganache this works perfectly and dirties less dishes). Allow to cool to room temperature, then place in refrigerator until chilled and stiffened. Gradually add strawberry puree by Tbsp, whipping each addition in well. Flavor only to your liking (I ended up using up the rest of the puree, which was perfect). Chill until stiff again before piping between macaron shells. Chill 24 hours before eating. The strawberry flavor was not as strong as I’d hoped from the plain shells, so I made the decision to add the remaining puree to the filling. It worked fantastically and after developing in the fridge overnight the tangy strawberry flavor had permeated through to the shells. Well of course I cut them out like hearts! In the bowl of a stand mixer, pour the gelatin into the cold water and allow to sit 10 minutes. In the meantime, bring the remaining water, sugar and corn syrup to a rolling boil for one minute. Immediately pour into the gelatin and affix to the stand mixer. Add salt and rose flavoring and beat for 8-10 minutes, or until fluffy but not stiff. Beat in the food coloring. While the marshmallow mixture is being beaten, line a small casserole dish or other somewhat deep baking pan with oiled plastic wrap (oiled side up! ), and oil a spatula (silicone rocks!) as well. Pour the marshmallow into the oiled, lined pan, coaxing it with the spatula. Smooth out and cover with another piece of oiled plastic (the pan I used ended up twice as big as I needed so I just folded half the plastic over). Allow to sit 3 or more hours (I left mine overnight this time just because I started them late). Prepare a jelly roll pan with a mixture of unsweetened cocoa powder and powdered sugar (I used maybe a 3:1 ratio). 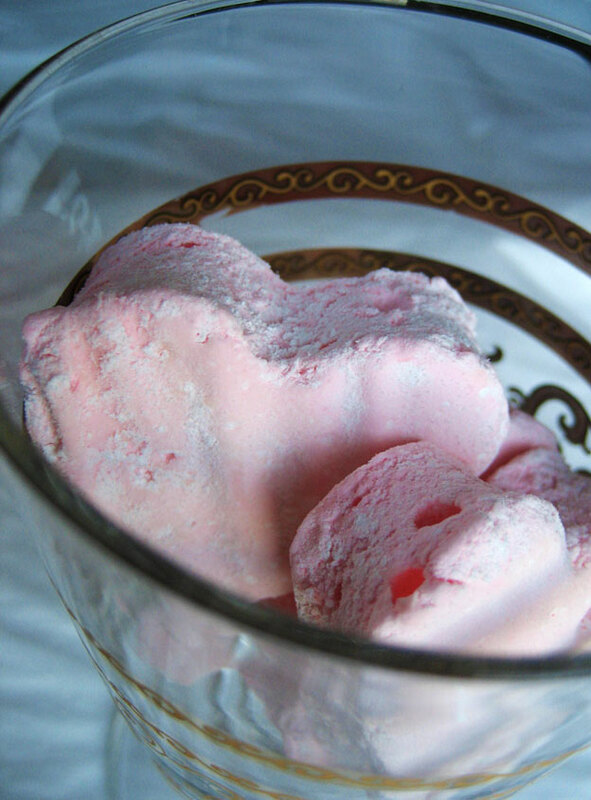 Cut the marshmallow with a heart-shaped cookie cutter (really, the shape helps make it!) dusted with cocoa powder and coat evenly with the cocoa/sugar mixture. Re-dust the cutter as you go. Use a cocoa-dusted pair of kitchen shears to cut up the remaining scraps and toss them in the cocoa mixture as well. Keep sealed in a plastic bag. I know I said I wanted to make my marshmallows corn syrup-free, but they really seem to be the most stable when made with it. And I know we don’t eat much of it (not normally a lot of processed foods in our diet these days)…AND it was the last of the bottle. So…oh well. And, totally worth it. Gorgeous contributions you made! Macarons are so temperamental, they drive me a bit crazy hehe. And good on you for making truffles out of the ganache-inspired! I tell ya, you could package these in cellophane bags and make a bundle selling them. They are lovely looking. Perfect for a girly gathering. What LOVELY bites of rose-hued beauty!! All of your sweet treats look deeeelightful. I saw a post for rose scented marshmallows somewhere, a long while ago (maybe Chocolate & Zucchini?) and have been dying to make some ever since. Except that I think they would be much harder than people let on, and I’m awfully lazy when push comes to shove. Also, your macaroons? To die. For. Really.